Taunton, MA – maxon precision motors, a division of maxon motor of Sachseln, Switzerland, has opened a new manufacturing facility on March 19. The two-story, 59,000 sq. foot facility is located within the Myles Standish Business Park in Taunton, MA. Company officials led by Chris Blake, mpm President, welcomed state/local officials and invited guests to a grand opening event at the facility which included a ribbon cutting ceremony and tours of the building. 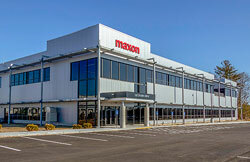 The new facility replaces a former sales/distribution and assembly operation in Fall River, MA, and will significantly expand maxon precision motors capabilities and employment. USA customers will benefit from closer collaboration that will provide value added opportunities with faster turnaround. Plus, a localized supply chain with domestic vendors will help build stronger customer relationships while reducing lead times.